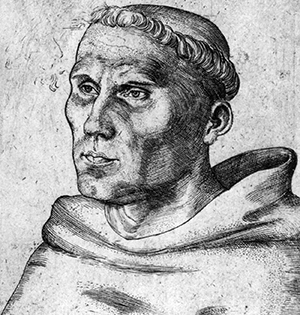 Martin Luther (1520 engraving by Lucas Cranach the Elder). CANADA – Throughout 2017, the East District of Lutheran Church–Canada is releasing abridged versions of some of Martin Luther’s sermons matched to various appointed Scripture readings from the three year lectionary, and encouraging congregations to use them as part of their own church services. “Martin Luther’s sermons for the church year, called ‘postils,’ were among his most influential writings for both pastors and people alike,” notes promotional material for the series. Reading these abridged sermons of Luther is a fruitful way to observance the 500th anniversary of the Reformation, the creators of the series explain, and is in keeping with the words of Hebrews: “Remember your leaders, those who spoke to you the Word of God” (Hebrews 13:7). The sermons have been prepared by a team of six pastors throughout the East District, who have condensed each of the sermons from about an hour in length to 12-15 minutes. The District has released a Luther sermon for March 5 (note that this sermon is unabridged and may need to be shortened before being preached). Following that, the series continues with regularly appointed, abridged sermons for April 9 (could be used any time in Lent); April 23; May 7; June 4; July 23; August 20; September 24; October 15; November 12; and December 31. (Some of these sermons have not yet been released. They will be made available to download from the District’s website as they become available; just visit the Calendar page, and select the designated date to find the download link). A bulletin insert to announce the initiative is also available for congregational use. Previous sermons for the series were also prepared for January 1 and February 12.